Sterile supply is a crucial component of all medical services. The journal Central Service aims to strengthen this prominent position. It has created a forum for all those who take an active role in everyday practice or research and development in this field. The well-balanced, reader-friendly content of the journal is composed of high-level scientific articles, reports from the field, recommendations of professional associations, relevant press items and news from the industry. 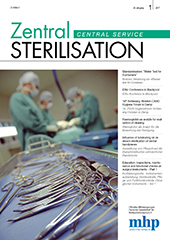 In addition to promoting a multidisciplinary approach, Central Service facilitates international cooperation for a uniformly high standard in sterile supply by publishing all articles in both German and English. In the last ten years, Central Service has become an integral part of national and international reference sources for questions concerning medical, technical and economic aspects of sterile supply. In this function it has greatly contributed to quality assurance in the prevention of nosocomial infections. As from 2018, digital access to English-language versions of Central Service will be available through the new Steri-World App.